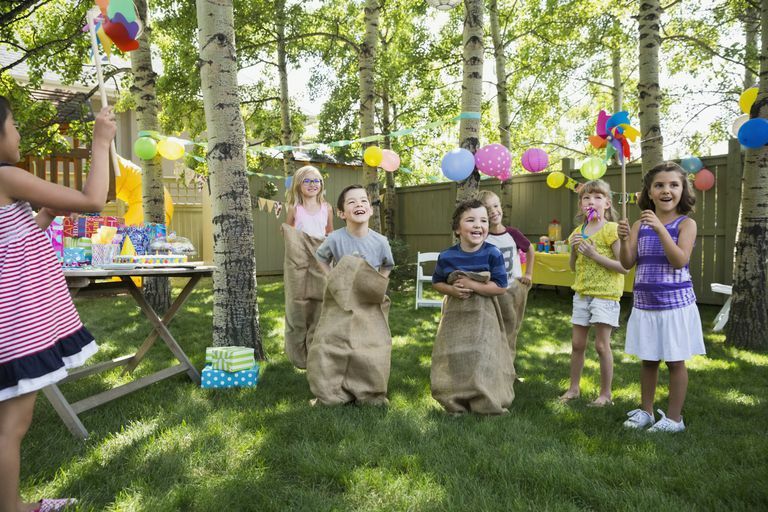 Kids love competing and playing and it is easy to combine the two for an obstacle-course birthday party. Planning a field day full of outdoor games is easy for parents and fun for kids. It is also budget-friendly and every parent loves that! The best part: The kids will be outside, enjoying fresh air, having fun and getting exercise. Children need at least an hour a day of physical activity and these games will help ensure they are getting enough. These games also develop gross motor skills and coordination. Your first step is to find an outdoor space. It should be in an area that is big enough to set up a few relay races and allows the kids to run around safely. If your backyard is not large enough, contact your local park and get a permit to host the birthday party there. If you have a dog, be sure to clean up the yard. You don't need children encountering dog feces. Mow the lawn a few days ahead so the kids don't get covered with fresh grass clippings. Next, you'll want to design some obstacle courses so the kids can race each other in teams. It will be even more fun if you and your grade-schooler do the planning together (they will have great ideas!). Get a pencil and paper and come up with a few sketches of "events." Better yet, go outside and set up mock courses to do some trial runs. Weather does not always cooperate with our party plans. It is always a good idea to have an indoor alternative ready just in case it rains the day of the party. If this happens, you will need to get creative real fast. Think of a few fun indoor games that kids can play in your living room, basement or (clean) garage. Many of the items you collect for the obstacle-course can be used inside as well. The relay races can be made in any combination you wish, using any of the above materials (or any you come up with yourself). If the outdoor space is large enough, lay out multiple obstacles at once. You can have the teams move to the next obstacle once they have completed the first. If you are limited on space, set up one obstacle at a time and keep a running tally of the winning teams for each event. Balancing a boiled egg on a spoon. A three-legged race or a sack race. Jumping rope, such as 10 times. Running through hoops laid on the ground. Racing to grab a swim noodle, hoop or baton and then racing back. Emphasize having fun and mix up the teams so that the most athletic kids aren't bunched together. Make sure that each obstacle has enough space so the kids don't accidentally run into each other in the heat of the moment. Have water available so kids can take a break and hydrate. This is particularly important if it's a hot day. Don't make the races so hard that they're frustrating. Remember, the goal is for everyone to have fun. Be sure to have prizes for everyone at the end so everyone gets something, even if their team doesn’t win. Don't forget the food! Use your patio table as a banquet of the treats you want to share with the kids after the race is done.